Ans: A set of programs running in the background on a computer system and providing an environment in which other programs can be executed and the computer system can be used efficiently. Q. What is the purpose of operating system? Ans: There are two basic purposes of an operating system. It manages the software and resources of the system. It provides stable and efficient way to use the hardware without having to know all the details of the hardware. Q. What is GUI OS? Ans: A GUI operating system provides the user a graphical user-interface to communicate with the computer. It provides graphical objects such as icons, menus, windows, buttons etc. Q. What is Command Line Operating System? Ans: A command line operating system provides a command prompt to the user for typing different commands to interact with the computer. The commands are given to the computer according to the predefined format. It is not an easy way to interact with the computer. The user needs to memorize commands to perform different tasks. Examples of Command line operating system are DOS (Disk Operating System), and Unix etc. Q. What is Windows Operating System? Ans: Windows is a popular GUI operating system. It is developed by Microsoft Corporation. It is widely used in businesses, educational institutes, and research organizations. Q. List out different objects of Windows Operating System? Ans: The on-screen work area on which application windows, icons, menus, and dialog boxes appear is called desktop. It is called desktop because the surface of screen looks like a desk with objects you might have on your own personal desk. Q. What is the use of My Computer icon? Ans: My Computer is a special icon on the desktop. It is very important object used for interfacing with computer. It enables user to see easily what is in his computer. The user can access everything in his computer such as hardware devices, disk drives and files & folders etc. Q. What is use of My Documents folder? Ans: My Documents is also a special folder on the desktop. It is automatically created when Windows is installed. Many Windows-based applications use “My Documents” folder as default folder for storing files. 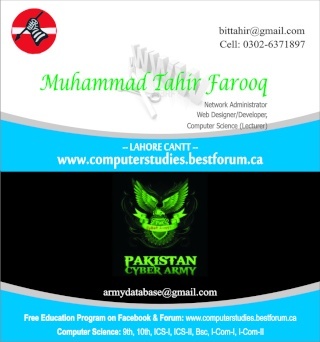 These applications may include: Ms-Word, Ms-Excel, Ms Access etc. Q. What is Recycle Bin? Ans: The Recycle Bin is a special folder of Windows on the hard disk. It has an icon on desktop. It contains files and folders that are deleted from the hard disk. Any files and folders you deleted from the hard disk are transferred to the Recycle Bin. These files or folders can be restored form the Recycle Bin to their original location if required for use. Q. What is Internet Explorer? Ans: Internet Explorer is a web browser. It is a part of Microsoft Windows operating system. It is used to access information on the Internet. It is a powerful web browser providing advance features to work on WWW. Q. What is Windows Explorer? Ans: Windows Explorer acts as a file manager in windows. It provides an efficient way for locating and managing files on computer. It also provides the most efficient way to manage the computer resources. Q. What is the use of start button? Ans: The start button is located at the left most side of the taskbar. Start button is the gateway of accessing most of the programs installed on the computer. When Start button is clicked, a menu known as start menu appears on the desktop. Q. What is Control Panel? Ans: The Control Panel is a special folder that contains the Administrative Tools (system software) used to perform system management tasks such as installing / uninstalling hardware devices, managing system resources, sharing printers, and setting up date and time etc. Q. What are Mouse Events? Ans: Mouse events are the actions that can be performed by using the mouse. The most common events of mouse are as follows. Ans: Loading multiple programs into memory and executing them at the same time is called multitasking. Ans: In multiprocessing, multiple programs are executed on different processors at the same time. Some operating systems have features of multiprocessing. In multiprocessing, operating system divides a task between different processors. Q. Define Multi-User Operating System. Ans: Windows 2000 is a multi-user operating system. A multi-user operating system allows multiple users to use the same computer at the same time (or at different times). Q. What do you mean by plug and play? Does Windows 2000 provides this feature. Ans: Some operating systems automatically detect and configure new devices when they are connected to the computer. This capability of an operating system is referred to as plug and play. Ans: The clipboard is a temporary space in the computer’s memory used for data holding that is being copied or moved. The Clipboard is used for storing text, graphics, or other data. After data has been placed in the clipboard, it can be inserted from the clipboard into other documents, in the same application or in a different application. Q. What is Primary Partition? Ans: A primary partition is one that can be used as system partition. Windows 2000asn other operating system can start from a primary partition. You can create maximum four primary partitions on a hard disk (or three primary partitions and one extended partition). Primary partitions can be created only on hard disk and cannot be sub partitioned. Q. What is File Management? Ans: A process of maintaining and organization files and folders in the computer is called file management. Data and programs instructions are stored in files on disk. A folder holds files and subfolders. Q. What is the use of Disk Management Utility? Ans: The disk management utility gives a graphical interface to user. By using this interface, the user can view and perform maintenance on all disk drives in computer. Q. What is Print Queue? Ans: When multiple documents are sent to the printer for printing, they are added in a queue in an order in which they are sent to the printer. This list of documents waiting to be printed on the printer is called print queue. Q. What is difference b/w single user operating system and multi user operating system? Ans: A multi-user operating system allow multiple users to use to the dame computer at the same time. A single user operating system allows only single user to use the computer at a time.